The New England Patriots dominated the Matt Moore-led Miami Dolphins in Gillette Stadium on Sunday, as Tom Brady’s four touchdown passes helped his team to a 35-17 win. Though Brady did have an interception, he was his normal, dominant self for a majority of the contest, completing 18-of-28 passes for 227 yards and his four touchdowns. Star tight end Rob Gronkowski hauled in five of Brady’s passes for 82 yards and two touchdowns. On the ground, Patriots’ Dion Lewis led the team with 112 yards on 15 carries. The Dolphins’ backfield, on the other hand, mustered just 67 yards on 19 combined carries, leaving Moore to take hold of the offense through the air. Moore completed 23-of-34 passes for 215 yards and one touchdown against two interceptions. With that, we give you our PFF-exclusive takeaways from the contest for each team. 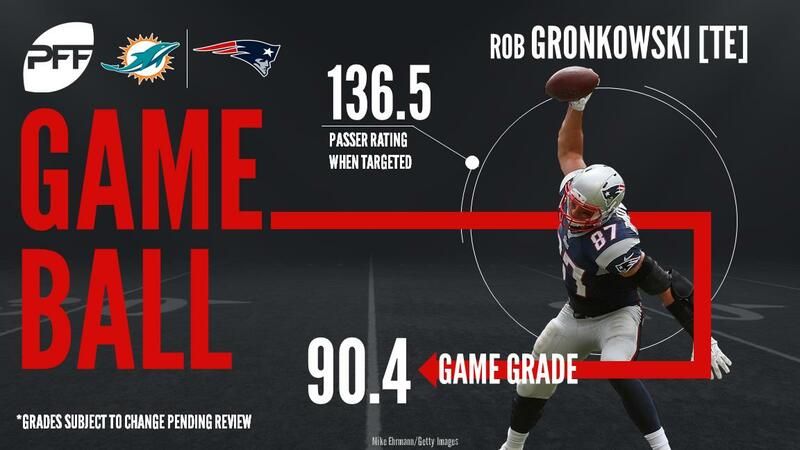 Gronkowski was his usual dominant self in the passing game, catching five passes on eight targets for 82 yards and two touchdowns. He gained 27 of those yards after the catch, and averaged a very impressive 2.83 yards per route run. But it was his run-blocking where he was most impressive. Gronkowski consistently sealed his edge and made impressive blocks en route to a team-high 95.7 run-block grade. Gilmore was targeted three times on 44 snaps in pass coverage. On those three passes, he allowed a 5-yard catch to make a quick tackle, intercepted a pass, and had a contested pass with safety Duron Harmon, who ended up with the interception on the Dolphins’ final offensive play of the game. In his second start of the season, the Dolphins offense struggled to move the ball and Moore had his worst performance of the year. The bulk of Moore’s completions and yardage came on short and dumpoff passes, with Moore completing just three of seven passes targeted 10-plus yards past the line of scrimmage, including two interceptions. In his first start in a year, Young played pretty well, and certainly better than the rest of the Dolphins offensive line. Young allowed just one pressure, a hit, on 44 snaps in pass protection and was the only offensive linemen to not allow a sack. He didn’t do a whole lot in the run game, ending with an average run-blocking grade. There wasn’t much to be impressed with from this Dolphins defense, but Wake continued to show that he’s still a top pass-rusher on the edge. Wake finished the game with a sack, three quarterback hits and another two quarterback hurries. That worked out to a solid pass-rushing productivity score of 21.6 for the game. Wake’s 83.1 pass-rush grade was the highest on the Dolphins defense. McCain was another Dolphin who impressed early on, although his day was cut very short when he was ejected for throwing a punch at Patriots’ receiver Danny Amendola. But before that, McCain was targeted three times in pass coverage and allowed just two catches for 23 yards. He stopped James White for a gain of just two yards on one of those receptions, and he had the interception on Tom Brady’s poor pass in the second quarter.